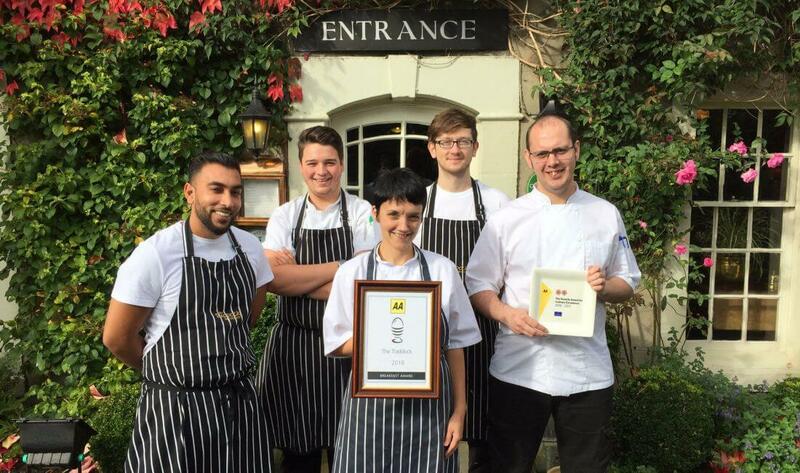 Thomas Pickard is Head Chef at The Traddock at Austwick. This beautifully appointed country house dates back to the 1740s and is nestled on the western edge of the Yorkshire Dales near Settle. Thomas took over the reins of the two-AA-rosette kitchen in July 2016 as the next step in a career that has taken in Bohemia in Jersey (1 Michelin star), Midsummer House (2 stars), the Star Inn at Harome (1 star) and Samuels Restaurant at Swinton Park (3 AA rosettes) where he worked his way up to the position of head chef. My mum was probably the one that got me into cooking in my early years, as we did a lot of baking and cooking together at home and it was something I really enjoyed, so my mum was definitely influential in me getting into cooking. But I then heard about a restaurant called El Bulli which people said was the best restaurant in the world, so I did some research and found a book called A Day at El Bulli, which I started reading and that was when I realised I wanted to get into fine dining. So far the most memorable meal I have ever had was at Noma when I was 22. I went there with my mum and dad who were on a cruise of the Fjords and there last stop was Copenhagen, so I told them that I was going to meet them in Copenhagen and we were going to Noma, so we did. I remember how excited I was as we walked through the door and sat at our table; it was just so different to any other restaurant I had been to, everything was perfect yet rustic. I also remember how strange I thought it was that the chefs were serving the food as well. The most memorable dish I had was the Ox tartar with tarragon emulsion and juniper. I was told to eat it with my hands, which I thought was strange, but it made such a difference. It really was an amazing meal and I’m glad I went when I had the chance. If El Bulli was still open that would be where I’d go; it's just somewhere I have wanted to go since I was about 15. I think Ferran Adria is a real innovator and he did stuff you wouldn’t be able to get anywhere else in the world. But as that is closed right now I would have to say Faviken in Sweden. Although there seem to be a lot of chefs these days, foraging, fermenting and growing their own stuff, I don’t think anyone does it quite like Magnus Nilsson. He just seems to know exactly how to use it and look after it, and manages to pull really inventive simple dishes. Another reason for going would be the setting, Faviken is in a stunning location near Are ski resort, 470 miles north of Stockholm and the fact that stuff only grows six months of the year, makes what he does even more amazing. Although I’m sure if you were to ask me the same question in a few months’ time the answer will have changed, as there are some many fantastic restaurants out there. Afternoon Tea: £15.95 per person, £19.95 per person with a glass of cava. (Served daily 3-5pm, reservation required). Cream Tea: £6.95 per person, £10.95 per person with a glass of cava. (Served daily 3-5pm). Sunday Lunch Menu: 1 course, £12.95; 2 courses, £17; 3 courses, £20.50. This menu is designed for the whole table to enjoy! 8 courses, £45 per person.